Arctium lappa, better known as burdock or cocklebur, is a thistle-like plant related to sunflowers and daisies. Burdock’s roots, seeds and stalks have been used for food, medicine and textiles. Its immature seeds, or burrs, were reputedly the inspiration for hook-and-loop closures, otherwise known as Velcro. Although widely cultivated in Asia, burdock is considered an invasive weed in North America. According to the “Encyclopedia of Plants,” burdock is grown for food in Japan and some parts of Europe, and its roots were consumed as part of the macrobiotic diet that was popular during the late 20th century. Known as "gobo" in Japan, burdock roots are rich in inulin, a soluble dietary fiber, and they are good sources of calcium, potassium, iron and amino acids. In her book, “Prescription for Herbal Healing,” Phyllis Balch states that burdock is used as a blood purifier to clear congestion from the circulatory, lymphatic, urinary and respiratory systems. It purportedly cleanses the kidneys and liver and helps to promote the elimination of bile. Burdock’s volatile oils confer diaphoretic, or sweat-inducing, effects, and its roots and seeds possess diuretic properties that help eliminate fluids from the body. 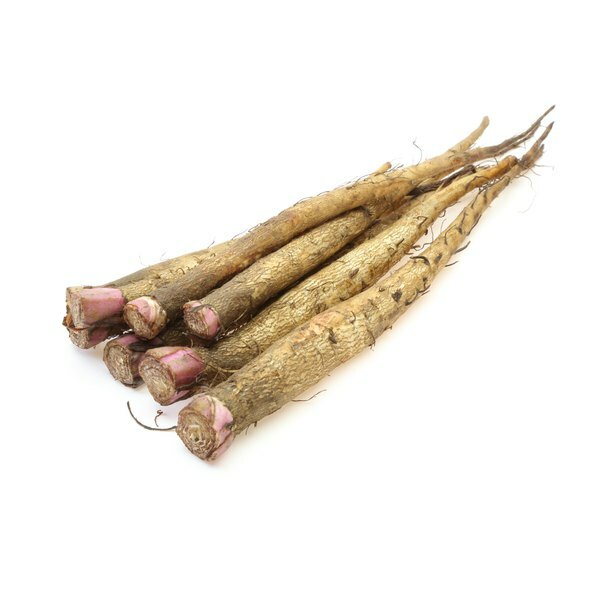 Fresh burdock root is used by some herbalists to help control blood sugars in diabetics, reportedly because inulin delays the absorption of sugars from the gut. According to the “Physicians’ Desk Reference for Herbal Medicines,” burdock is used by Chinese physicians to treat a variety of skin conditions, such as boils, dermatitis and ulcerations. In combination with other herbs, it is useful for sore throats and other respiratory complaints. Chinese burdock is also used to eliminate excess nervous energy, and it is considered to have aphrodisiac properties. Burdock is one of the principal ingredients in Essiac tea, an herbal preparation that was formulated in 1922 by Rene Caisse, a Canadian public health nurse. Because it supposedly possessed immune-stimulating and tumor-shrinking properties, Essiac was promoted for use in cancer patients. In addition to burdock, Essiac originally contained slippery elm, sheep sorrel and Indian rhubarb. Other ingredients have subsequently been added to the formula. There is no scientific evidence to support the use of Essiac for treating cancer in humans. According to Phyllis Balch, large doses of burdock can stimulate uterine activity. Therefore, pregnant women should avoid using this herb or use it with extreme caution. Although burdock has been used for generations, there have been relatively few scientific studies to evaluate its benefits or side effects in humans. As with all herbal preparations, people who have underlying medical conditions or who take prescription drugs should consult their physician before taking burdock.